Three years ago, we learned that a Dutch team had developed a biological concrete that could repair its own cracks. They said it might be two or three years before it found its way into the larger world—and now, we’re getting a look at its real-world applications. The concrete is a collaboration between two scientists named Eric Schlangen and Henk Jonkers, who are profiled today in an update on their research from CNN. The duo first made news in 2012, when they introduced their “biocement,” which uses bacteria to patch up the cracks in concrete that lead to structural degradation. Here’s how it works: Traditional concrete aggregate is mixed with bacteria and capsules of calcium lactate. When a crack in the concrete forms, water seeps in and “activates” the bacteria, which is hard-wired to eat calcium lactate. When it does, it produces calcite—an ingredient of limestone—that accumulates to fill the space between the crack. When io9’s Robbie Gonzalez reported on the project in 2012, it was still being tested in a lab. CNN visited Jonkers in the Netherlands to find out how development has progressed in the time since. 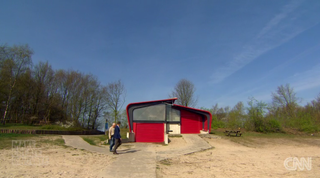 Jonkers and his partner have used the mixture in a real building—a lifeguard station on a lake. They’ve monitored how small cracks in the facade formed, and how the bacteria produced limestone the fill them in, almost like skin that forms a scab and then heals over completely. “We were really happy to see that it worked,” he says in the video. The idea of buildings that can heal themselves has been around for decades—like the architectural nanotechnology used to rebuild Neo Tokyo that William Gibson famously imagined. It’s cool to see a technology that was being developed in a lab just a few years ago actually used in real-world buildings.